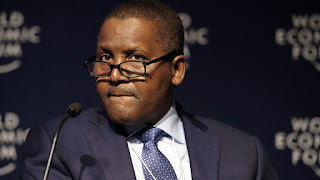 Africa’s richest man and business mogul, Aliko Dangote has called on Africans to pray for oil prices to remain low. The billionaire businessman, who is currently erecting a petroleum refinery with a production capacity of 650,000 barrels per day, made this call on Wednesday in New York. He said the crash in oil prices was the only way to wean Africans of dependency on petroleum revenues. “We should pray that oil prices remain low. This helps wean us off the dependency on revenues from petroleum. “We must take oil to be the icing on the cake. We already have the cake – agriculture, agriculture, agriculture. Africa will become the food basket of the world,” he said. The meeting, which had high-level business leaders and international diplomats in attendance, was organised by the Corporate Council for Africa at the headquarters of global law firm, Shearman and Sterling LLC. Alongside Paul Kagame, president of Rwanda, Dangote emphasised the need for heavy investments in education, “particularly for young people to be well-trained for the jobs of tomorrow”. Dangote said Rwanda’s success story is an example of the positive change in Africa, adding that corruption “had been cured” in the eastern Africa country.